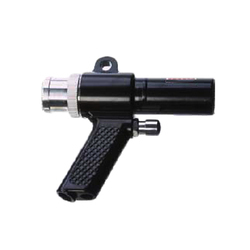 Leading Manufacturer of x-stream hand vacuum gun from Mumbai. The X-stream Hand Vacuum Gun is the low cost solution to a variety of industrial housekeeping applications. It is a blow gun, a vacuum gun, a collection system and a transfer system in one simple package. The X-Stream hand vac is light weight die cast aluminum and uses less air than a normal blow gun. The amplified air flow is approximately 12 times the air consumption. It draws a vacuum at one end to produce a high vacuum for collection or transfer of materials. It is easily converted from a blow gun into a vacuum gun and back again. In blow off mode, the 1-1/4” (32 mm) diameter allows it to cover a much greater area than a small blow gun for faster cleaning and drying. It can also be used to transfer material over a long distance using a vacuum hose which can be supplied. In vacuum mode, it can be used to vacuum up debris if more appropriate than blowing air, and debris can be collected in an available reusable vacuum bag. Model 36011:Collection System consists of X-stream hand vac plus reusable collection bag, cleaning brush, crevice tool, skimmer tool, two extension wands, and stainless steel hose clamp. Model 36012: Transfer System consists of X-stream hand vac plus 10 foot (3 m) vacuum hose with cuffs at both ends, cleaning brush, crevice tool, skimmer tool, two extension wands, and stainless steel hose clamp. (3 m) vacuum hose with cuffs at both ends, reusable collection bag, cleaning brush, crevice tool, skimmer tool, two extension wands, and stainless steel hose clamp. Looking for X-Stream Hand Vacuum Gun ?